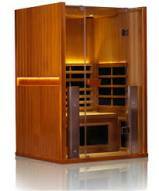 Polar sauna heaters are manufactured by Saunatec, one of the largest manufacturers of saunas and steam equipment in the world. They come in several residential models including the HMR, HNVR, and the Steamy, and two commercial-size models -- the Saunatime and the LA. The residential models are all wall mounted while the commercial units are free standing. You’ll find that all of the Polar electric sauna heaters come with the controls built-in but can be ordered with external controls. More features on the units are. You can upgrade to the HNVR model which has an optional external wall mounted control panel, including a digital read out display. These Polar sauna heaters will run about $700 - $800 depending on the size of the unit (4.5 to 8kw). 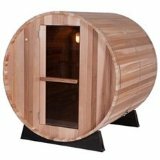 The Polar Steamy sauna heater sells for around $2000 which is pricey among electric heaters. 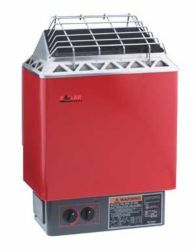 But the money is well spent as the Steamy includes its own built-in 2kw steam generator which can be connected to a water supply source for an automatic fill (purchased separately for about $75), or can be filled manually by the user. Check out the most popular heaters from Polar on sale here! The Steamy allows the bather to enjoy the benefits of both a dry sauna and wet steam room; that is, it can produce the effects of high temperature with low humidity, low temperature with high humidity, or a mix of both. 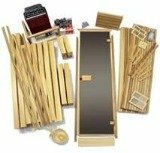 The control panel on the Polar Steamy sauna heater includes a light switch, timer, thermostat with sensing probe, and knobs for selecting traditional sauna, lower temperature sauna with steam generator activated, or steam only. Polar electric sauna heaters utilize a larger rock capacity tray in order to produce the traditional Finnish sauna experience of soft gentle heat. Additionally, the beautiful red enamel exterior makes them about the most attractive sauna stoves we’ve ever reviewed. 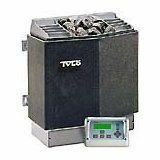 We should also mention that the quality and performance of Polar sauna heaters ranks them among the top tier of heater stoves found anywhere in the world.